Fabulous hosts! The room and en suite were lovely, as were the made to order breakfasts every morning. The hosts were incredibly friendly and proffered excellent advice everyday, improving our touring land and making restaurant reservations for us. Would most definitely go back and recommend highly to others!! The location was in walking distance to shops and restaurants, which was invaluable. We enjoyed our stay. Everyone was friendly, the property was well maintained and very clean, and the breakfast was very good. Kingfisher Lodge is a good value for the price. I had a wonderful stay! The staff is very friendly, my room was clean and comfortable, and breakfast was very tasty. Location is great, within walking distance from the train station and the park. I will definitely come back! Lovely place and very welcoming hosts. We've stayed here a few times already and will continue to do so when we come back to Killarney! Wonderful stay, very comfortable, clean, great location, delicious breakfast! Very nice place and the hosts were wonderful. Good location--a bit down the street from downtown, so it was quiet. Wonderful food and a great location. Very easy walk to the town center. The staff were great. Lovely B&B. The hosts are friendly and helpful. Breakfast was tasty and the room was very comfortable. Excelentes instalações, fácil acesso ao centro da cidade e serviço muito profissional. Very nice inn. Wonderful breakfast in the morning. Rooms were clean and well-maintained. Easy walking distance to town. We stayed at Kingfisher Lodge for four nights in June. Our stay was perfect. The room was comfortable and quiet with plenty of room to move about in. The breakfast was plentiful and delicious. The location was a very convenient walk into town for dinner and shopping. Kingfisher Lodge is a lovely B&B in a very convenient location. You can walk into the center of Killarney easily to shop or dine. There is parking, an excellent breakfast every morning, and very friendly staff. My room was clean, cozy, and quiet. It was a perfect base to explore the area and an excellent value. Highly recommended! We had such a lovely stay at the Kingfisher Lodge. Everyone was so friendly, and the breakfast was delicious. The room was very comfortable, and the location was great -- very quiet but close enough to walk to the main street. We thoroughly enjoyed our overnight stay at Kingfisher Lodge. The room was great and the breakfast was exceptional. We appreciate all of the friendliness and graciousness of our hosts. The helpful tips of things to do and experience in Killarney were very beneficial. We highly recommend this lovely B & B! We were extremely satisfied from the time we arrived to the minute we departed!! We took the train from Dublin to Killarney and when we arrived I called and was given spot on walking directions. Much to our surprise, we had picked a perfect location and were within walking distance of pubs, restaurants, shopping, etc. Our room was lovely with plenty of closet space and an updated bathroom. Everything was spotless! The breakfast was delicious as well!! Great location, parking space, lovely room, well cooked breakfast, nice people - perfect! A bit expensive by UK standards, but the current exchange rate is not helping that, and prices seem comparable locally, so this may be a slightly unfair comment. Certainly delivers everything you could need from a small hotel/b&b, so no complaints. Very nice place. Very clean place. Better than the $$ hotel that I stayed at in Dublin. Gave you your choice of breakfast in the morning. Located a short walk to town. Very convenient. Lovely place, peaceful environment flowers, birds song....and Jazz company Ann & Donal make our stayment as the best we expected, helping us to organize our short time in Killarney. The service team was also too kindly. Five minutes far from the down town and the main services we needed Coach Tours, train station.... In summary, we don't have to look for other place if we visit this lovely site again. Congratulations! Very friendly hosts. Very good breakfast. It was beautiful!! I had the pleasure of spending a few days here, Fantastic host ,rooms and breakfast with their lovely ladies who served us! I would recommend this place to anyone. Absolutely loved this place and one day will return..: P.S. try the pancakes!! Nice place and good people. Everything as expected. And within walking distance to the city. Very recomendable. The Kingfisher is an excellent B&B. It is perfectly situated right outside of the city center. We were able to just park the car and walk into town. The rooms were big and the hosts were very friendly and helpful. Breakfast was delicious and made to order. Sadly we only stayed one night but it was a the perfect location for us to explore Killarney National Park and start the Ring of Kerry. I would definitely recommend this B&B. We loved this b&b! The host, Ann, was very helpful with suggestions for Killarney and the Ring of Kerry. Her place is beautiful. Lovely and comfortable room, fabulous breakfast, and great location. Highly recommend! This was my second stay in the Kingfisher the first being two yeas ago. As before this B&B is faultless. It is very central to Killarney centre 5 min walk, spotless, quiet, amazing breakfast and very helpful hosts. It is ideal as a base to tour Kerry and I look forward to my next visit. I recommend the Kingfisher very highly. Cosy room, friendly staff, great location. So glad we stayed here! Lovely clean rooms and wonderful hosts. The breakfast was exceptional. We had come from The Fitzwilliam in Dublin and were headed to Glenlo Abbey in Galway.. 5 star places. We were as pleased with the Kingfisher. Great location as we could walk into Killarney town for dinner - even our 75 year old Mom with a sore back enjoyed the short walk. I was glad I followed the review on Trip Advisor and booked with them. Stayed at Kingfisher with my husband and two friends this past weekend. Excellent on all fronts and everyone so welcoming and willing to help in any way. Breakfast was just wonderful and our rooms were so well prepared and so clean. Could not recommend highly enough and it's location is just amazing-two minutes to town centre. Thank you all for making our stay so pleasurable. Communication was good before my arrival, and check in was easy. The staff were very helpful and friendly. The house is conveniently located to the major tourist areas, and it was easy to get to from the major driving routes. The room was very nice and the bed was very comfortable. Breakfast was delicious. All of the facilities are as advertised and shown in the photos. I can honestly say this is the best B&B I have ever stayed in. I was warmly welcomed at reception and advised of some top tips to stop and do along the way. I had booked a single room but was upgraded to a twin that was very spacious and very clean and super comfortable. The breakfast was much like that of a 5 star hotel and once again, I was warmly welcomed in the morning with smiles and the offer of tea and coffee. There were options of cooked or continental breakfasts - amazing and delicious in a beautiful room filled with natural light looking onto the gardens outside. The location was perfect for driving the Ring of Kerry. Thank you so very much for the quality night sleep and great start to my day! Good place to stay and good location since it was walking distance to Killarney center. It is also a great location for touring that area of Ireland. Nicely appointed room, though without much of a view Room 8. Clean, well-stocked bathroom. Very warm welcome and helpful, informative hosts. Excellent breakfasts. Altogether a pleasant stay. My only criticism would be that I was not offered the option of paying in Euros or GBP when leaving on my UK credit card. I would have preferred to pay in Euros, but the machine automatically converted to pounds and there was no way of changing this once done. Hence, I got a much poorer exchange rate than I would have if I had simply paid in Euros on my card. Not a deal breaker, but an annoying end to what was otherwise an enjoyable hotel experience. Brilliant stay, comfortable quiet room, great breakfast and lovely owners and staff. Location is just a short walk from Killarney centre for shops, bars and live music. Dont miss the white pudding mmmmmm! Our first experience in an Irish B&B, and we thoroughly enjoyed it. The landlady was nice, competent and always ready to help. Great place to stay! Very nice rooms and lodge. Clean and cozy place. Incredibly friendly staff and owners...went way out of their way consistently to provide recommendations, answers to questions, etc. Great people. Perfect location....quick walk to the main restaurants, shops and pubs, but quiet location and good if you have a car. I will definitely go here again if I return to the area. Our stay at Kingfisher was very enjoyable. The accommodations were lovely, the breakfasts delicious. The proprietors were so helpful giving us ideas of places to go, and directions for getting there. We thoroughly enjoyed Killarney and the surrounding area, and the ability to walk to town each evening. This is a lovely B&B. I travelled solo and my "single" room was very spacious, beauttifully decorated, and with a bright, roomy bathroom. The shower was great! And the hosts made an excellent breakfast: very fresh and flavorful. The B&B location was conveniently located to the town center, but on a quieter side street. Would highly recommend! We stayed here for two nights as part of our honeymoon. It was a absolutely lovely place to stay with a great location close to the pubs and restaurants downtown. I would definitely recommend it to anyone looking for a nice quiet place to stay. Our stay at Kingfisher Lodge B&B was nothign less than superb. It is a luxury B&B whit a very good location. The room was spacious, very very clean and breakfast very tastful and there is a great choice. Staff was very serviceminded, polite and friendly. The host gave us some very good advice what to see and experience in beautiful County Kerry. Much recommendable. Very nice B&B with very good breakfast. Only a 5 min. walk to the city. Kind hosts with good tips. We had a great room, everything was very clean and lovely arranged. We were there for 4 days and we enjoyed a lot our stay. Bedroom were very nice, the breakfast was good and the attention of all the staff was excellent. They helped us with the activities we wanted to do visiting the area. Staying at Kingfisher was quite good! The location is good, not far from the station. The room was sunny and clean and was cleaned everyday. The breakfast was so nice. Every morning I enjoyed the meal. They were so kind. They're always ready to help me to get information and booking a tour. I really appreciated staying at Kingfisher. I strongly recommend. What a lovely stay! Very helpful and friendly hosts, a comfortable and clean room, and a tasty breakfast! Even a short walk to the town center. It couldn't have been better. In four weeks of travel, it is one of my favorite stays. Couldn't ask for any more during my recent stay at The Kingfisher Lodge B&B. I was down in Killarney with a few friends for a concert and on arrival at the b&b, we got a very warm welcome from the owner. The b&b is situated right in the the town and only a 10 min walk to most shops, pubs and restaurants. The service there was second to none, breakfast was lovely and the beds are very comfortable. I will definitely stay here again the next time I'm in Killarney and would highly recommend it to anyone travelling to this lovely part of the country anytime soon. super sejour. propriétaire accueillant. serviable. petit déjeuner. chambre. tout était parfait. b a b à recommander. It was just perfect for our stay of three. Breakfast was varied and we all enjoyed the food and service . We wanted somewhere close so we could walk into town and it was just what we had wished for. Our room and cleanliness was excellent. If you are touring Ireland, make this the last stop. Because it is so good, whatever comes afterwards, could well be a letdown, no matter how good. Ann and Donal, are very helpful, and welcoming. The bedrooms are spacious, beds great, and everything you need is available in the bathroom. Shower is good, and the quality of everything in the B & B is excellent. Both Ann and Donal are very knowledgeable, and will help you to plan your days, even when going to a different area. The breakfasts were plentiful and tasty. My wife and I were sorry to leave, but would have no hesitation in returning. This is the best B & B , in which we have stayed, and as I mentioned in the title,a lot better than some hotels. Kingfisher Lodge is a clean, comfortable guesthouse. There is a friendly welcome. My friend and I enjoyed our stay. We will return, and not only due to the wonderful room and delicious breakfast and most endearing owners and staff! Donal was very accommodating and provided an early breakfast for us since we were leaving very early the next morning. He gave us great advice and guidance. The room was wonderful and very clean. I would have loved to have been able to stay for longer, but it wasn't to be so. Can't recommend it enough. It was a nice stay at this well-tended guesthouse. The pleasant owners gave us a lot of hints for interesting trips. The guesthouse location serves as a perfect starting point for trips around the peninsulas and the national park. We were very pleased with our stay at Kingfisher Lodge. The room was very clean with comfortable bedding. The breakfast was delicious. It was a very short walk to the city center but was far enough away to be very quiet at night. Stayed there last Saturday 28 Feb 2015. We booked 3 rooms and it was as good as any 4 star hotel. Rooms spotless and modern. 5 min walk to town centre. Great choices for breakfast. Very quiet at night and free parking and wifi. Recommend it highly. Just back from a lovely stay in the kingfisher guesthouse, we were met by Ann on arrival and looked after really well. The rooms were beautifully presented, clean and fresh. Breakfast was also well presented and plenty of it. Our stay was excellent and we would highly recommend it. Very well located to town centre of Killarney and for travelling around the area. An excellent place to stay. Comfortable, tidy, well appointed with a handy location. Friendly and helpful host. Overall a good value accommodation easy walking distance to downtown Kilarney. Excellent hospitality. We got extra help to dry our soaking wet clothes and hiking shoes. We had a lovely time in Killarney and the Kingfisher was a great base for two nights. Location was great to walk into town for dinner. The only suggestion would be more precise directions on the web site. We got lost trying to find the house. Street names or numbers don't always match with the maps! Was very good,the owners were very helpful give us breakfast at 5am the morning of our ring of Kerry cycle and let us have a shower on our return. Will diffenetly stay again. Brill !! Excellent. Staff also very cheerful and helpful. My daughter and I stayed at Kingfisher Lodge in Killarney for three nights and really enjoyed it. We stayed in a private twin bed room which was clean and inviting. The amenities coffee and tea in room plus towels and shampoo, shower gel and lotion were great. Plus, we got a nice, large glass bottle of water everyday. When we came back from a day touring we even got a pitcher of ice water. So nice! The private bathroom and shower were great. The daily free hot breakfast was wonderful. The B & B owners were friendly, and my daughter and I loved interacting with their two dogs! This beautiful B & B is close to everything including the train station! We loved our time at Kingfisher Lodge and would love to return. Killarney is a special place! Thank you for making our stay so memorable and comfortable! Excellent location, Comfortable accommodation, Top quality breakfast. Nice hosts who didn't intrude and gave us our own space, while also being very accommodating. Would definitely recommend and will return myself.. Wonderful experience! Anne and Donal make you feel as comfortable as if you are in your own home. Every aspect of the service, the food, or any need that may arise is outstanding. The place was great. The location, breakfast, and hospitality were wonderful. Beautiful accommodations, convenient to everything! Hosts could not have been more gracious! Would stay there again when/if we return to that part of Ireland. Helpful owners. Clean room, and delicious breakfast. Close to shopping/restaurants/many activities! It was a very nice, clean place. Very convenient to the city center. We would definitely stay here again! Can't rate this high enough. The bed was the best bed we slept in our while trip. They went out if their way to help bus out, give us a good deal and even did a load of laundry for us! Can't wait to come back! on the weekend of the 27th sept.i had the pleasure along with 3 of my ENGLISH friends of staying at the kingfisher,it was 5 mins to the town center,the rooms were comfortable and spacious,food very good,DONAL and ANN VERY FRIENDLY AND EXTREMELY INFORMATIVE ON THE INTERESTING PLACES TO VISIT,we all enjoyed our weekend in KILLARNEY and will without any shadow of a doubt be returning to the KINGFISHER ,thanks DONAL AND ANN AND YOUR STAFF FOR A WONDERFUL STAY . We loved the Kingfisher Lodge! It was in a perfect location and the rooms were spacious and immaculate. The owners gave us great tips for our sightseeing plans and were very helpful. Donal was very welcoming and accomodating. He offered great advice on walking/hiking excursions in the area. I only wish I had been able to stay more than one night. Clean rooms, great breakfast, perfect location. 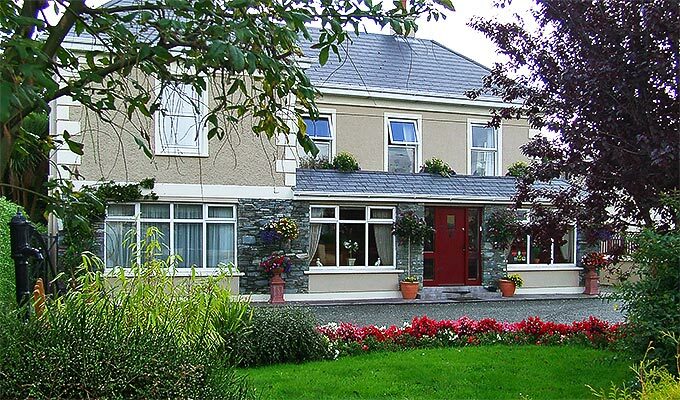 Comfortable, clean, and friendly B&B at the heart of Killarney. Stayed in the family room that was perfect for our needs. A very nice guesthouse, just 10 minutes walk from the center of Killarney. It was just what we expected. We also really appreciated all the information Ann and Donal gave us about activities in the area. lovely place to stay! the room was a bit small but very well decorated. great big shower! This is a very nice accommodation. It is close to amenities and the train station. The staff is very helpful. We will recommend this to our friends in Canada. Wonderful stay with great breakfast - parking at door, walk into town, able to sit in sunroom and enjoy drink and book out of the wind - sorry we were only one night but plan to return! Fantastic Accommodations The innkeeper was very friendly and knowledgeable about the area The rooms were extremely clean and comfortable Breakfasts were delicious Was stayed in a 2nd floor room, and the walls seemed a bit thin as we could hear virtually everything from the guests occupying the room on the floor above us However, I would recommend this B&B!